You’ve taken a major first step to resolving hearing problems you or someone you care about is experiencing. Now let’s take the next step to hearing well... together. On our website, read whatever interests you about hearing instruments, hearing loss or the services we provide. Then call us today for a free hearing screening. P.S. 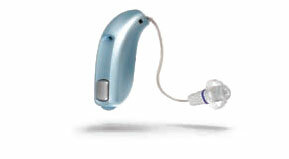 Today’s hearing devices are very 21st century. Some are almost invisible while others are smart with lots of great features. Check out the product lines. For more than 25 years, University Audiologic has helped thousands to improve their hearing. Owner and Audiologist Deborah R. Powell, M.S., takes pride in helping her clients. Her knowledge and professionalism are only matched by the personal relationships she builds. Debbie wants to understand exactly what her clients need and then provide it. Hearing loss affects 34 million people in the US. That’s 1 in 10 Americans! And 95% of Americans with hearing loss could be successfully treated with hearing aids.